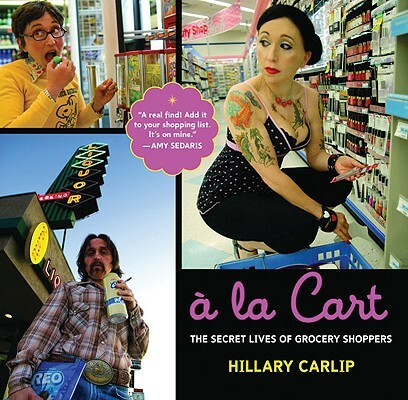 A comic original in the tradition of Tracey Ullman and Lily Tomlinwith Cindy Sherman's eyeHillary Carlip transforms herself into America's most unforgettable grocery shoppers. It's happened to all of uswe find, tucked away in the corner of our shopping cart, someone's discarded grocery list. Who's the person buying "Whole milk, heavy cream, ice cream, cheese, and Gas-Ex?" Why would someone need to write down "Coors and Oreos" on a matchbook covercouldn't he just remember those two items? And what's the person like who scrawled their list on a PROZAC notepad? Taking her clues from the items listed, the types of paper written on, the handwriting, and even misspellings ("Aunt Spray"), Hillary saw that each listat once mundane and personaloffered an intimate peek into a complete stranger's life. She chose 26 lists and imagined who the shoppers might be. She then transformed herself into all 26 people, one by one, literally stepping into each characterall ages, genders, and ethnicitieswith hair, makeup, outfits, and one Fu Manchu. Photographer Barbara Green then captured unforgettable images of Hillary portraying these shoppers at their neighborhood markets. Hillary came to love these characters, so her accompanying stories for each are as poignant and hilarious as the photographs. She brings to life richly imagined inner worlds, including one for macho Woody, a self-described "Lady's Man with NO BANKRUPTCIES ready to meet just one Special Lady with NO KIDS." After getting to know these grocery shoppers through Miss Carlip's dedicated voyeurism, going to the supermarket will never be the same. Hillary Carlip's memoir, "Queen of the Oddballs: And Other True Stories from a Life Unaccording to Plan," is an American Booksellers Association "Book Sense Pick" and was selected by Borders as one of the Top Literary Memoirs of 2006. She has appeared on countless radio and TV shows, including "Oprah" and the" Ellen DeGeneres Show." The creator, host, and editor of the acclaimed literary website freshyarn.com, she lives in Los Angeles.